All polling stations have opened, but some opened late, and one in Beira at Inhamizua primary school only opened at 11.15 am because staff were only sent then. Long queues remain in a few places, including Tete and Angoche, some polling stations still have queues of 20 to 30 people, including Marromeu and Chimoio, but in most there are no longer queues. Turnout will probably be about 50%, more in the north and less in the south. Turnout is very mixed. Each polling station should have 800 voters, and normally each on is in a school classroom. But correspondents note that often one classroom will have a long queue and the adjoining one with no one waiting. Most people appear to be voting in the morning. Bored young me in long queues in some places have created disturbances and in some cases the police have had to intervene, and have restored order. But nearly everywhere our correspondents report smooth operation of polling station. Two polling station chairs (presidents) have been arrested for handing out extra ballot papers to voters, and are currently being held by the police. They are in Massinga, Inhambane, and Ilha de Mocambique. In Massinga the issue was denounced initially by the Renamo delegate (poll watcher), who said that the chair was giving three ballot papers to Frelimo voters. In Ilha the chair was caught by the Renamo party agent. Our correspondents report similar incidents in Maganja da Costa, Ilha da Mocambqiue, and Angoche. Our correspondent sent a photo of 4 filled in ballot papers aken from the chair of polling station 03086-02 in Aeroporto, Angoche. + In Mandlakazi two MDM members were arrested for using a delegate credential in which the original name was erased and theirs was added. Renamo has detained two people it claimed were voting illegally in Nacala Porto. The two were properly registered in Nacala but had identify cards giving their addresses as Mossuril and Ncala a Velha. Renamo has no right to detain voters, and many people have identify cards with old addresses and have moved to new places where they register to vote. 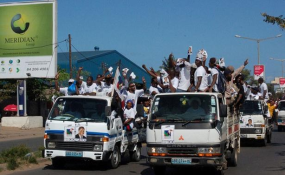 In a press conference at noon today, Renamo spokesperson Andre Magibire claimed that Frelimo was bringing voters into Nacala by the truckload, including an entire large truck with health workers. There are problems with register books in the polling stations. When Quelimane mayor Manuel da Araujo and his wife went to vote this morning in Coalane, they were not in the book held by the polling station chair. After some discussion they consulted the copy of the list held by the Renamo delegate which had their names, and they were allowed to vote. In Gurue our correspondent reports that 500 voters have been left off register books in three polling centres, including the Renamo head of list Adriano John, who was required to present a copy of his voters card in order to stand, so must be registered. Our correspondent in Nacala confirms a similar issue there. In Nhamayabue, Tete, voters were not on the list given to the chair but were on the list in the polling computer operated by STAE to assist voters. All parties were given a full copy of the electoral register, and in many places they have printed this out and given a copy to the polling station delegate, so they can check people when their name is read out before being given their ballot papers. But in some places, polling station staff are confiscating the printed lists. Our correspondents report this in Dondo and Xai Xai. and at the press conference Magibire said that in Gaza the provincial STAE had given instructions to polling station staff to do confiscate copies of the register. In his press conference today Magibire said that fake register books are being introduced, and that is the reason that copies held by Renamo are being confiscated in some places.